Introduction to "The Synaxarion: The Lives of the Saints of the Orthodox Church"
When the Apostle John was taken up in the spirit before the throne of God where all await the universal Judgement at the end of time, he heard "as it were the voice of a great multitude, and as the voice of many waters, and as the voice of mighty thunderings saying, 'Alleluia: for the Lord God omnipotent reigns. Let us be glad and rejoice, and give honor to him; for the marriage of the Lamb is come, and his bride has made herself ready.' And to her was granted that she should be arrayed in fine linen, clean and white: for the fine linen is the righteousness of the saints" (Rev. 19:6-10). This is not only a foretelling of what will be at the dawning of the day of Resurrection; for even now, Holy Church, the Bride of Christ, stands clothed, as in purple and fine linen, with the blood of the martyrs, the tears of the ascetics, the temperance of the virgins, the preaching of the apostles, the writings of the Fathers, the mercy of the righteous, clad, that is, in all the virtues and in all the graces that the Holy Spirit has brought to birth in the saints of every age and place. Who could number the cloud of witnesses (Heb. 12:1) that surrounds us? Who could name each one of the living who with Christ, through Christ, and in Christ have triumphed over death and have access to the throne of God, the saints in whom the Lord rejoices (Isa. 41:16 LXX) and takes his rest (Isa. 57:15 LXX). They have become fellow-citizens with the Angels and brethren of Christ. And He appears in each one of that "great multitude, which no man could number" (Rev. 7:9), as the one and only Lord, just as the innumerable reflections of the sun in great waters belong to the one heavenly body. The saints who dwell today in the City of the Great King, in the Land of the Living, are a multitude of stars in the spiritual firmament enlightened by Christ, the Sun of Righteousness (Mal. 4:2). "How precious also are thy friends unto me, O God!" exclaims David the Prophet-king. "If I should count them, they are more in number than the sand" (Ps. 138:17-18 LXX). The thousands of saints commemorated in all the synaxaria and martyrologies of East and West are only a small part of this great congregation (Pss. 39:1O; 81:1, etc.). They are the saints venerated by name in the Church; but many more by far are those who humbly treasured God in the hidden depths of their heart, unknown to all, and preserved from the praise of men, in whatever place the Lord appointed for them: patriarchs, prophets, apostles, martyrs, confessors, bishops, priests, deacons, monks and virgins, men and women, old and young, rich and poor, harlots and brigands, people of every rank and condition who, for love of God, accepted suffering for the sake of bringing forth in our human nature all the different flowers of the Grace of the Holy Spirit. "For to one is given by the Spirit the word of wisdom; to another the word of knowledge by the same Spirit; to another faith by the same Spirit; to another the gifts of healing by the same Spirit; to another the working of miracles; to another prophecy; to another discerning of spirits; to another divers kinds of tongues; to another the interpretation of tongues. But all this is the work of one and the same Spirit, dividing to every man severally as he wills" (1 Cor. 12:8-11). The world is sanctified, saved and redeemed through the presence of the saints that are in it like the leaven in the loaf (cf. Matt. 13:33), preparing mankind for the final revelation of the Lord Jesus Christ. He will come then in his glory, that the light of his divinity may shine with no shadow at all upon his Body, the Church. At that time, the number of the saints that are to appear upon the earth will be accomplished, whose names, known to God alone, "are written in the Lamb's book of life" (Rev. 21:27). Then, as Saint Gregory the Theologian writes, 'the world above will attain perfection'  and the saints of every age will be united in the one and only Body of Christ, whose union with his Bride, the Church, will have reached its fulfillment. Mankind will then be the House of God, the Heavenly Jerusalem. Christ, who at this present time, keeps hidden in his saints, will shine forth in them with all the brightness of the glory that is his eternally with the Father and the Holy Spirit; "That all may be one as thou, Father art in me, and I in thee, that they also may be one in us" (John 17:2 1), as He said when He offered Himself in sacrifice for our salvation. But until this day, the House of God is still in building. The Lord tarries and awaits the entry of all the saints into the spiritual house as living stones (1 Pet. 2:5) conjoined every one to Christ, the Cornerstone (ibid. v.6; Is. 28:16), according to the different gifts of grace that each has been given (Eph. 4:7). 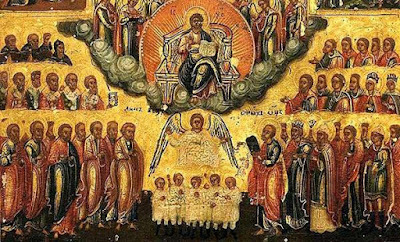 The Saints are, at the same time, one and many and, as members, contribute in a unique and matchless way to the knitting together of the whole Body of Christ. Again, they are as the gold and precious stones that adorn the raiment of the Bride, who stands, like the Queen, at the right hand of the Lord "in a vesture of gold wrought about with divers colors" (Ps. 44:10). So, like the diamond and all precious stones, they refract the light, sending forth everywhere in many-colored beams the peerless light of the threefold Sun. But to be penetrated thus by the light, they must first be cut, faceted and freed of foreign material and of impurities by the hammer and chisel of sufferings, of persecutions, and of all kinds of afflictions. And as wrought gold adorning the vesture of the Queen, they must be refined of all dross in the furnace of temptations, so as to be jewels fit for the clothing of the Church and Bride of Christ. The saints who shine with the divine light have become gods by the grace of the Holy Spirit, to the extent that "baptized into Christ they have put on Christ" (Gal. 3:27). To the extent that they have taken up their cross with Christ (Matt. 16:24), so as to crucify in themselves the old man (Rom. 6:6), full of passions, sins and all uncleanness, they have been able to share also in the glory of Christ's Resurrection. By partaking in Christ's Passion through martyrdom, ascesis, tears and practice of all the evangelic virtues, the saints have overcome death with Him. They are henceforth alive to God (Rom. 6:11), for Christ has made his abode with them. "I have been crucified with Christ, they cry; it is no longer I who live, but Christ who lives in me" (Gal. 2:20). Christ has ascended into Heaven, yet He has not abandoned the Church on earth; Christ has ascended into Heaven, but He has sent us the Holy Spirit who makes of all the saints christs, gods by Grace. The work of our Lord Jesus Christ and even his Person, at once divine and human, are recapitulated and extended in the Church by the lives of the saints through the action of the Holy Spirit. Some people, whose minds and hearts are insensible to the spiritual life, are bored by the lives of the saints. 'It's always the same story', they say. Indeed it is always the same story of martyrs, confessors, ascetics, virgins and holy lay people, living in the first century or only yesterday in Asia, Palestine, Egypt, Italy, Africa or America. All of them have had a heart on fire with love for the Lord and have partaken in his Sacrifice by the freewill-offering of themselves so as to have a share in his Resurrection. All of them have been baptized into his death by the baptism of water, by the baptism of blood, by the baptism of tears, to make a way within themselves for the new life of the Spirit that the "glory of God in the face of Jesus Christ" (2 Cor. 4:6) may dwell in their hearts and overspread their bodies. The saints live in Christ Jesus, and Christ lives in them. He repeats without cease, in the saints, even to the end of the world, the unique mystery of His death and of His resurrection, of the Incarnation of God and of the deification of man. In frescoes depicting the martyrs, especially on Mount Athos, in some of the refectories where the military saints are represented, one often notices that, although the figures, clothing and accoutrements of the saints differ, they all have a similar face, and the face is that of Christ. This same likeness to Christ really is found in all the saints, despite the infinite variety of their personal characteristics and of the circumstances in which they have shown forth the work of Christ in particular places and at different times. But, in the saints, this showing-forth of the Lord's Passion is never a sorrowful repetition; it is ever new, ever fresh, ever proper to itself, and contributes in an irreplaceable way to the edification of the Church of the first-born (Rom. 8:29). The Lord Jesus has opened the way. He has saved human nature by putting death to death in his own body. But now, each one of us is called by name to work out this salvation freely in himself. "I complete in my flesh what is lacking in Christ's afflictions," writes saint Paul, "for the sake of his Body, that is, the Church" (Col. 1:24). The Apostle's words do not at all imply that anything is lacking in Christ's redemptive work, but simply that each one of us has, freely and in a personal manner, to share in His sufferings (2 Cor. 1:7), so as to be a "partaker of the inheritance of the saints in light" (Col. 1:12). The saints do the works of Christ because, by faith and grace, they are united to Him. It is Christ himself, dwelling in them by the Holy Spirit (cf. John 14:10), who works miracles, converts idolaters, reveals the hidden wisdom of spiritual knowledge, reconciles enemies and fortifies the bodies of His saints to meet the most dreadful torments with joy; so that the Gospel continues to be written, even to this day, through the evangelic labors of the saints. Thus, whether near at hand or far away, whether ancient or modern, the saints are trustworthy guides to Christ who dwells in them. "Be ye imitators of me, even as I also am of Christ" (1 Cor. 11:1), the saints say to us with Saint Paul. If we want to make the image of Christ shine within us, we must often cast our eyes upon the saints to find real, practical examples of how to live. An artist who wants to paint the portrait of someone he has not seen in the flesh, makes use of existing likenesses of that person, studies them carefully and compares them to get inspiration. We ought to look on the lives of the saints in a similar way. By reading and comparing them, we will learn how to move forward in the life in Christ. If we live "with all the saints" (Eph. 3:18) by attentively reading their lives each day as we walk in the spiritual garden of the Synaxarion, we shall discover little by little those whom our heart especially goes out to. They will become our close friends in whom we love to confide our joys and sorrows; whose lives we love to read time and again, as well as to chant their troparia and to venerate their icons. These close friends will be the guides of our choice and a great comfort to us along the strait and narrow way that leads to Christ (Matt. 7:14). We are not alone on the road or in the struggle; we have with us our Mother, the All-Holy Mother of God, our Guardian Angel, the Saint whose name we bear and those close friends we have chosen out of the Great Multitude of those who stand before the Lamb (Rev. 7:9). When we stumble through sin, they will raise us up again; when we are tempted to give up hope, they will remind us that they have suffered for Christ before us, and more than us; and that they are now the possessors of unending joy. So, upon the stony road of the present life, these holy companions will enable us to glimpse the light of the Resurrection. Let us search then, in the lives of the saints, for these close friends and, with all the saints, let us make our way to Christ. One day a meek and simple Athonite monk, one of those to whom Christ promises the inheritance of the earth (Matt. 5:5), was getting ready as usual to address in prayer the saint of the day with abundant tears and many bows to the ground; but when he looked for his calendar, he realized he had mislaid it and had no way of knowing who the saint of the day was. So he began his prayer with the words, 'Saint of the day, intercede for us!' upon which the saint appeared before him and said his name was Lucillian (3 June). Without the least amazement, the good old man ended his prayer with the saint's name, but, being a little deaf, he had not quite caught it and said, 'Saint Lucian intercede for us!' The saint appeared again and said reprovingly, 'I am not Lucian but Lucillian', and vanished, leaving the monk to continue peacefully in his prayer. This story is a good illustration of how homely we should be with the saints, and it shows how close they are to us as active helpers in our daily life, listening to our prayers, setting us on our feet when we have fallen, showing us by countless signs of their presence, that our life is truly not of this world but that we live as strangers and sojourners between heaven and earth. In the early years of the life of the Church when the Christians gathered in small local communities, often secretly for fear of persecution, they did not keep as many solemn feasts as we do today. The weekly observance of the Lord's Day, when all communicated in the holy Mysteries, was at the center of their common life. At the same time, it became customary to offer the Eucharist on the tombs of the martyrs on the anniversary of their birth-day into Heaven. At this meeting, or synaxis, the local bishop, or one from a neighboring community renowned for his eloquence, would deliver an oration in praise of the martyr. Where the community possessed them, the Acts of the trial and passion of the martyr would be read and, later on, also an account, piously gathered in a special book, of the miracles accomplished by the martyr since his death. Each local Church would thus have its own liturgical calendar called a Martyrology. The veneration of certain saints gradually spread beyond the bounds of their Churches of origin, most often because of the miracles worked through their relics. These attracted pilgrims and the veneration of other Churches who sought the martyrs' protection, particularly if they had been able to obtain some fragments of their holy relics. This led to the appearance of general Martyrologies, covering whole ecclesial regions, that developed parallel with the local Martyrologies and gradually absorbed them. The scope of the Martyrologies was extended when the struggle against heresies produced many holy bishops and priests who offered their lives for the purity of doctrine, and whose feasts, as confessors of the faith, were added to those of the martyrs. When the larger communities could no longer gather in private houses, great basiicas were built over the tombs of the martyrs, where the Church met not only on the martyr's feast day but also for the regular weekly or even daily worship. Liturgical development accelerated in the fourth century with the end of persecutions and subsequent recognition of Christianity as the official religion of the Roman Empire. Splendidly adorned churches were built everywhere, the services were enriched with hymns, new feasts were instituted of the Lord, of the Mother of God, and of the saints and martyrs of universal renown. Soon each day in the year was dedicated to the memory of one or more of the holy martyrs, confessors or ascetics, venerated locally or generally in the Church. The reading of the Acts of the martyrs or of other saints was then taken out of the church service and replaced by hymns. Prominence was given to the mystical and initiatory aspect of the liturgical assembly considered as 'Heaven upon earth', as the anticipation in this world of the Kingdom of Heaven, as the dread moment of the reconciliation of all things in the Body of Christ, under the appearance of the precious Eucharistic Gifts. So the universal and cosmic aspect of the Church took precedence over the local aspect of the fraternal meal of the first centuries, and is reflected in the development of the calendar of saints. During the entire Byzantine period, the calendars of the local Churches constantly tended towards unification around the calendar of the Great Church of St Sophia in Constantinople. But some flexibility and local variation always remained, and even in Constantinople until the fifteenth century; each church and monastery retained its own calendar, though the principal saints' days were the same as in the calendar of the Great Church. The iconoclast heresy of the eighth and ninth centuries was directed against veneration of saints as well as against their holy images and, in general, opposed the presence of any intermediary between ourselves and God. The Orthodox reacted by attaching even more importance to veneration of the saints. Once the heresy was overthrown, they covered the walls of the churches with icons, were zealous in writing long lives of the heroes of Orthodoxy and completed the calendar and the Church service. The holy hymnographers of the Monastery of the Stoudion, Saint Theodore, Saint Joseph and others, ordered our Church services in the form they have retained ever since. 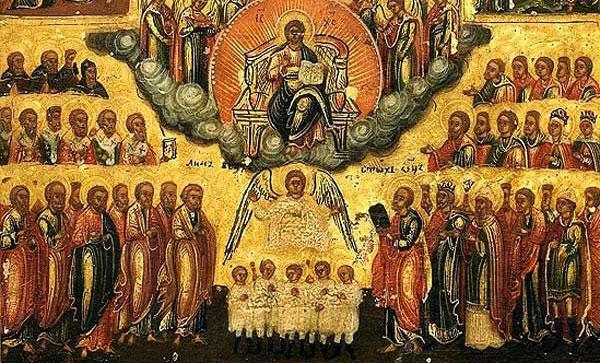 After the sixth ode of the Matins canon, because of the number of hymns, the reading of the lives of the saints of the day was restricted to brief notices, called the Synaxarion, as a vestige of the practice of the first liturgical assemblies. From the ninth to the eleventh century, the compilation of the short notices that appear in the Synaxarion was completed. More often than not they are derived from the long lives written by Saint Symeon Metaphrastes in the tenth century or by one of the great ecclesiastical historians such as Eusebius of Caesarea, Socrates, Sozomen or Theodoret. The notices inserted later in our Menaia are thus no more than reminders. The lives of the saints, their exploits and miracles also found an audience through longer written accounts but, above all, through the oral tradition of the people, as one finds even today in lands of Orthodox tradition. The whole Orthodox ethos is spread abroad in a lively and popular way by the oral and written transmission of the deeds and miracles of the saints. The Orthodox faithful have always learnt from the lives of the saints how to act as disciples of Christ, whatever the circumstances. They have learnt the doctrines, and how to proclaim the Faith, how to make the spirit of Christ reign in every situation: in our thoughts, in our behavior, in our family, in our working life; how we ought to read, to pray and to chant; how we should look upon the natural environment; how we should use technology for the glory of God and not in the service of Satan. The lives of the saints in the living tradition of the Church are not only a spiritual guide-book as already indicated, they are also a true 'encyclopedia of Orthodoxy',  full of information relevant to the Christian. Knowledge of theology, philosophy, ethics and psychology of secular and church history of ecclesiastical geography, apologetics and scriptural exegesis can all be gathered from the experience of the saints, not in a dry academic way but reflected simply and directly in the example of their godly lives. In fact, the lives of the saints are so much at one with the tradition of the Church that they are the Tradition itself. But the life of a saint cannot be reduced to an article in a dictionary of biography or to a chapter in Church history; it is a verbal icon of the saint that, while telling the story as accurately as possible, lets the hidden aspect of the work of the Grace of God in the saint shine through. Just as an icon can only be venerated in the context of worship with the appropriate dispositions, so the life of a saint can only be read in the Church with the eyes of faith and not according to the criteria of secular scholarship. This does not imply credulity but spiritual awareness of the mystery of Christ in us. Orthodox tradition is wonderfully balanced in this regard. Although in the life of ascesis and noetic prayer (noera proseuchi) all forms of imagination are excluded, our tradition, seeing how strong imagination and representation are within our nature in its fallen state, makes its own their power, which for man without God is a source of division, and transfigures them in iconography and in hagiography, so that they become a genuine means of entering into communion with God and with His saints. What some people have described as 'uncertain stories and legends' are, in fact, the true story of Man in his relation to God that the tradition of the Church brings to us in its own particular way. 1. 'Christians are kept in the world as in a prison-house, and yet they themselves hold the world together'. Epistle to Diognetes, chap. 6,7 (tr. J.B. Lightfoot, The Apostolic Fathers, Ann Arbor MI, 1956, p. 254). 2. Oratio 38; In Theophania, 2 (PG 36,313). 3 Fr. Justin Popovich, 'With all the Saints' (prologue to his Great Synaxarion), in Anthropos kai Theanthropos (Athens, 1969) pp. 83-84,86. 4. 'The man who despairs of himself when he hears of the supernatural virtues of the saints is most unreasonable. On the contrary, they teach you supremely one of two things: either they rouse you to emulation by their holy courage, or they lead you by way of thrice-holy humility to deep self-contempt and realization of your inherent weakness': St John Climacus, The Ladder of Divine Ascent, Step 26, 126 (tr. by Archimandrite Lazarus Moore, London, 1959). cf. St Barsanuphius and St John of Gaza, Letters 600 and 689. 5. St John Chrysostom, Homily on all the holy martyrs, (PG 50, 761 CD). 6. Justin Popovich, loc. cit. From Volume One of The Synaxarion: The Lives of the Saints of the Orthodox Church. This is not the complete Introduction, but rather an excerpt from pages vii to xviii. Published by the Holy Convent of the Annunciation of Our Lady, Ormylia (Chalkidike, Greece), 1998.